Post subject: May in Philadelphia! Philadelphia City Hall is the seat of government for the city of Philadelphia, Pennsylvania. At 548 ft (167 m), including the statue of William Penn at the top, it is the world's tallest masonry building: meaning, the weight of the building is borne by granite and brick walls up to 22 feet thick, rather than steel; the principal exterior materials are limestone, granite, and marble. 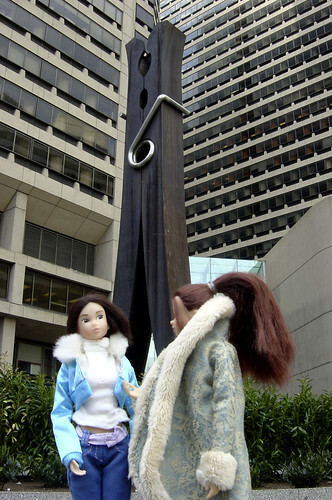 This funkeh sculpture was created by Claes Oldenburg in 1976. One of my favorites around the city. Well, of COURSE Mizuki would educate May on Women's Rights and Equal Rights movements. Mizuki is fairly politically active and savvy. Sorry for poor focus - it was hard to get a shot with no people in it, and the light is funky in there. City Tavern - supposedly favorite of Bennie Franklin back in those days. These days, the waiters all dress up in Colonial getups. The food's ok, too. I have to say, Philadelphia Mural Anti-graffiti projects are amazing on so many levels. 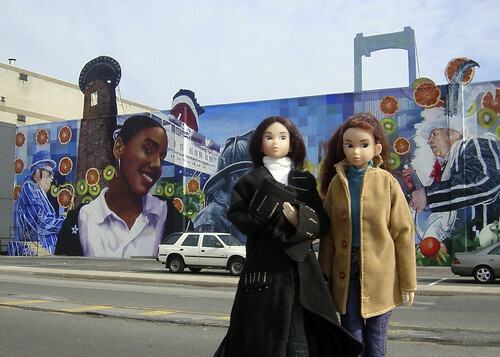 They make the city look prettier; there are some stunningly beautiful art pieces among them; they depict city (and national) history; they range from realistic to decorative to fanciful to abstract; they draw on the community (many are painted by kids from ghettos who get organized into a project and there are artists supervising them, so later, that area does not get vandalized, because vandalizing would normally be done by the same kids, and who wants to vandalize something you or your neighbor worked so hard on?). This mural is on the wall of a Shoprite that's off of Columbus Blvd. Trashy 'hood, but what a glorious mural! I believe it was sponsored by Shoprite (hence, I think, the floating produce), but don't quote me on that one. Snyder Plaza is a little shopping place near Delaware Avenue/Columbus Blvd. - a really seedy 'hood. I'm not sure who was responsible for this mural. Gosh, lovely - and I really really love the anti-graffiti project! What a great idea!! I wonder if they have to re-paint them or make new ones as younger generations move up? 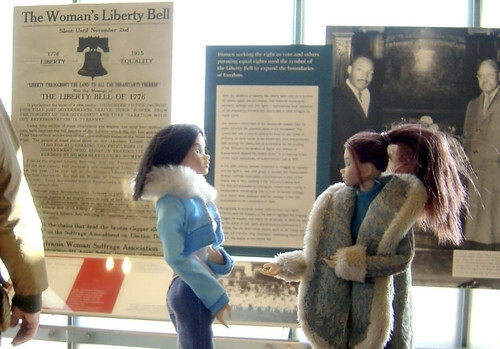 And of COURSE Mizuki gave Jack a lesson about Women's Rights and Equal Rights too? Wow! Nice job! Very realistic scenes of showing a vistor around. Mikan - thanks! I think depending on location they either renew the paint (if it's a more famous one) or just scrape it all and do a new one. Mizuki tries to give Jack all sorts of lessons, but with doubtable results. venlur - thanks! Graffiti can be very creative, I like that kind, too. 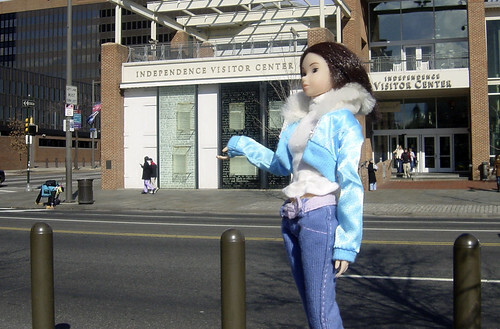 Ooo, more lovely Momoko in the city scenes and Philly this time (gotta get me there some day)! I love the way you have it scaled, to make it seem like Momoko is life size!